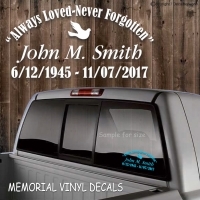 Custom "In Lovining Memory" decals are a great way to remeber loved one's and friend's. Quality vinyl decals made to go on the outter surface. Weather proof and will stick to any clean smooth surface. Select a style below and edit your text, see a live pre-view of what your decal will look like. Check back as we will be adding a few more design templates and you will be able to upload your photo's to make a very special decal.